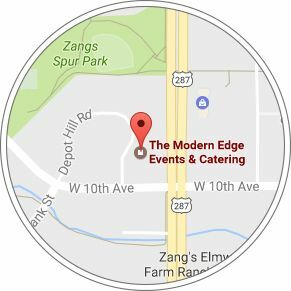 Call US: 720.299.7638 Email Us: sales@modernedgeevents.comVisit Us: 1000 Depot Hill Rd, Broomfield, CO 80020Open Monday thru FridayMon thru Fri 9:00 AM to 5:00 PMSaturday & SundaySat & Sun By Appointment Only Call, email, message, or visit us today! We are located in Broomfield, Colorado and serve the entire front range area. Our bespoke catering, event planning, and service is available to make your upcoming occasion a perfect reflection of your taste and style. So contact us today to make your dream event a reality.